Ants can be annoying and destructive to your property. So it is best to take the necessary measures to exterminate ants naturally. 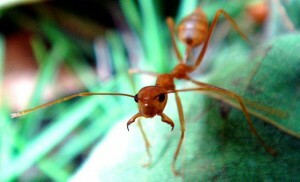 Most homeowners ask the assistance of licensed local pest control companies in Richmond to destroy ant infestations. However, there are natural ant control methods that you can follow and these cost less if done the right way. Here are some helpful ideas on dealing with your ant infestation problem. Warning! If you are doing this by yourself, always take extra precautions to avoid accidental swallowing by little kids in your house. Pesticides can be harmful to your family especially to the children. So, as an alternative, you can use chalks. The calcium carbonate in this material deters ants. What you should do is to draw a line around every doors and windows in your house. You can also use powdered chalks by scattering it around garden plants. This is a safe and effective way of preventing ant infestation. The next thing to do is to use lemons. This may be hard to believe but they are actually natural ant repellents. Squeeze lemon juice especially around the doors, windows, holes and cracks in one’s house. To increase its effect on ants, place slices of lemon peel near the entrances. Aside from these, you can also pour lemon juice directly in the anthill. Thirdly, you can use a planter to exterminate these pests. What? How is that possible? Well, all you have to do is to cover the anthill with an inverted planter. Then pour some boiled water through the drain hole in the bottom of the planter. Problem solved. In this manner, you can ascertain the extermination of the ants. Plus, you won’t have to use toxic pesticides that are harmful to one’s health. Another way of preventing an ant infestation in your abode is through a vinegar solution. Mix vinegar with water in a spray bottle and after that, spray it over an anthill. This might not kill them but it will encourage ants to go away since the smell of vinegar is a very strong repellent for these pests. If you really want to totally annihilate the ant’s existence then better use Boric acid. It is a common ingredient in pesticides control products. Anyway, this is what you should do. Sprinkle some boric powder along the cracks and entrances of your house. Ants will surely die once they pass through these points. Just a friendly reminder, take extra precaution when applying boric acid. Warning! Boric acid can be lethal to adults and especially children. If aren’t sure how to exterminate bugs in your home, DO NOT HESITATE TO ASK a professional local Richmond Indiana Exterminator today! All Pest Exterminating Inc. is a locally- owned & operated full service pest control company dedicated to serving the community with quality pest control at an affordable price.